AIR RESEARCH 24 February/March 2018 unmanned systems inside In addition, Black Swift is in the middle of a NASA-funded effort to use machine- learning algorithms and additional sensors to help make the UAS smarter and safer. "For instance, icing is not always easy to de- tect, but by looking at the performance of a vehicle and comparing it to its nominal be- havior, it can deduce icing based on how the system's degrading in how well it climbs and how much lift is getting generated," Elston said. "It can also see if noxious gases may be affecting the UAS by the performance of the motor." 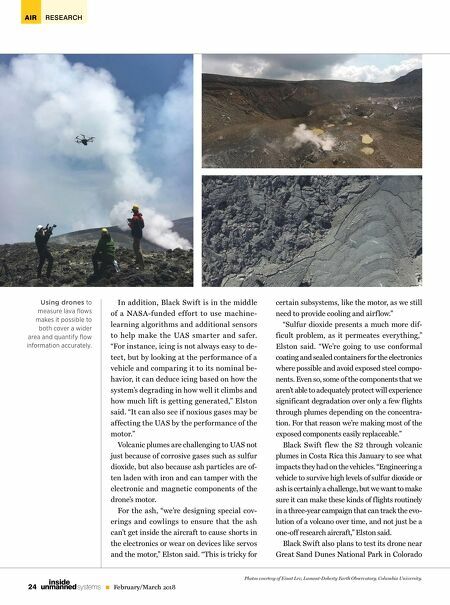 Volcanic plumes are challenging to UAS not just because of corrosive gases such as sulfur dioxide, but also because ash particles are of- ten laden with iron and can tamper with the electronic and magnetic components of the drone's motor. 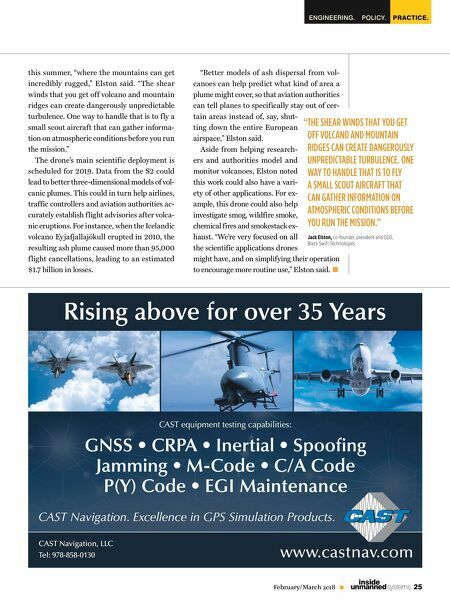 For the ash, "we're designing special cov- erings and cowlings to ensure that the ash can't get inside the aircraft to cause shorts in the electronics or wear on devices like servos and the motor," Elston said. "This is tricky for certain subsystems, like the motor, as we still need to provide cooling and airf low." "Sulfur dioxide presents a much more dif- ficult problem, as it permeates everything," Elston said. "We're going to use conformal coating and sealed containers for the electronics where possible and avoid exposed steel compo- nents. Even so, some of the components that we aren't able to adequately protect will experience significant degradation over only a few f lights through plumes depending on the concentra- tion. For that reason we're making most of the exposed components easily replaceable." Black Swift f lew the S2 through volcanic plumes in Costa Rica this January to see what impacts they had on the vehicles. "Engineering a vehicle to survive high levels of sulfur dioxide or ash is certainly a challenge, but we want to make sure it can make these kinds of flights routinely in a three-year campaign that can track the evo- lution of a volcano over time, and not just be a one-off research aircraft," Elston said. Black Swift also plans to test its drone near Great Sand Dunes National Park in Colorado Photos courtesy of Einat Lev, Lamont-Doherty Earth Observatory, Columbia University. Using drones to measure lava flows makes it possible to both cover a wider area and quantify flow information accurately.